If I keep having days like today for a year, I’m going to have to create new superlatives. The touring today was phenomenal! I woke before my alarm, fully refreshed, ate my six Kaloches and a pint of cottage cheese, drank a cup of cabin coffee, and was on the road before seven a.m. All day on U.S. 385, I road number I know well because U.S. 385 goes through Levelland, Texas, where I lived in 1978 – only 800 miles away! The morning was cool, the breeze light, the road empty, the shoulder perfect, the slope downhill. 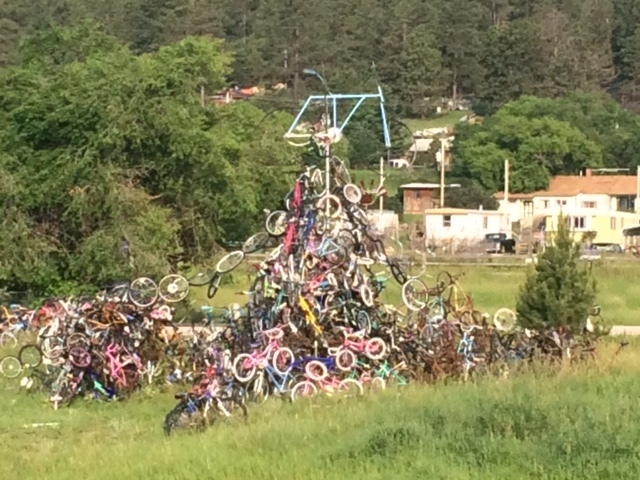 The roadside was gorgeous until I got to Pringles, which has a cool bicycle sculpture amidst all kind of junkyards. 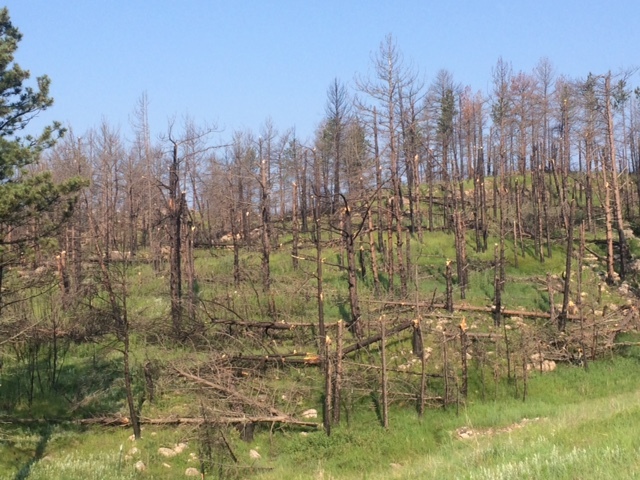 Just when I was thinking that man has no respect for nature, I came to a huge section of blighted trees, and realized that sometimes nature has no respect for nature as well. 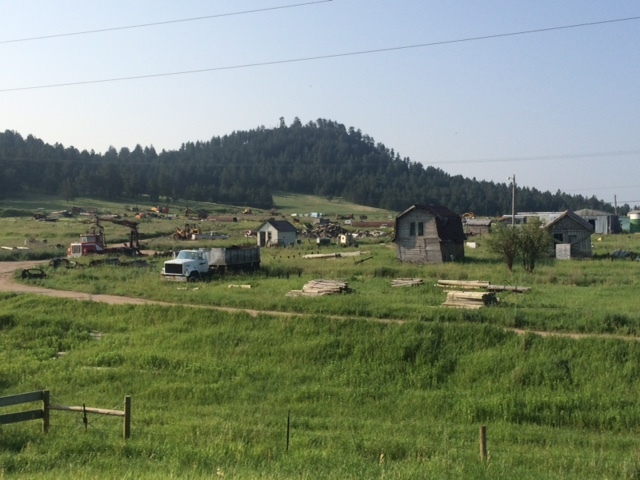 The bug infestations in the Dakotas are severe this year. 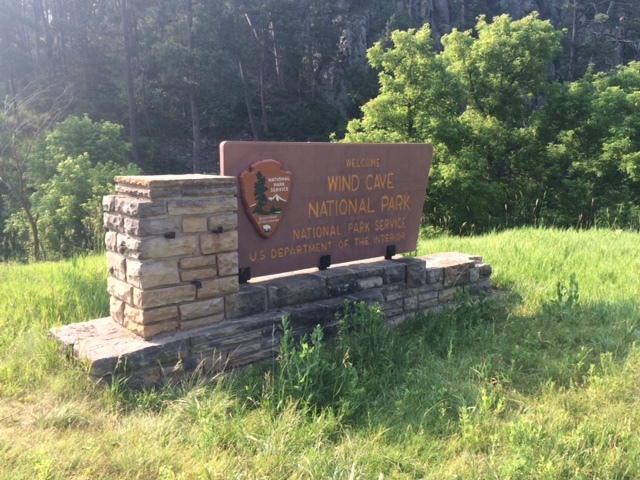 I got to Wind Song National Park before nine. Never heard of the place before, but it’s majestic. Teddy Roosevelt made it our seventh National Park – who knew? Wind Song’s main feature is an immense cave – 212 miles long. 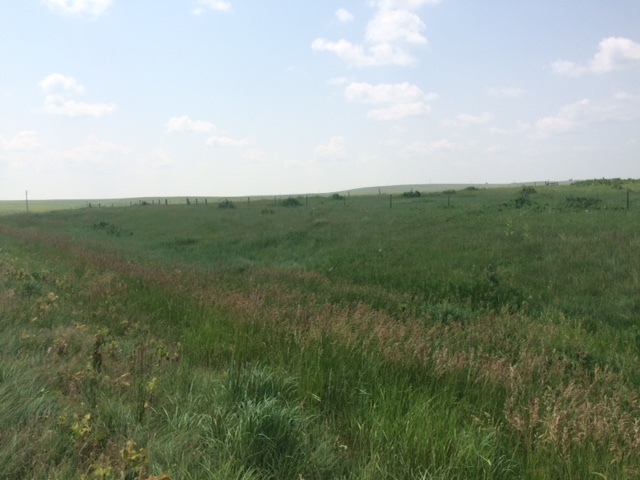 I skipped that, as I am not into caves, and spent most of my time adoring the Prairie Dog towns and keeping a keen eye out for Bison. They roam free in the park – I had to cross a cattle guard getting in and out – and are notoriously unfriendly to cyclists. I didn’t want a race with a bison, and thankfully avoided it. 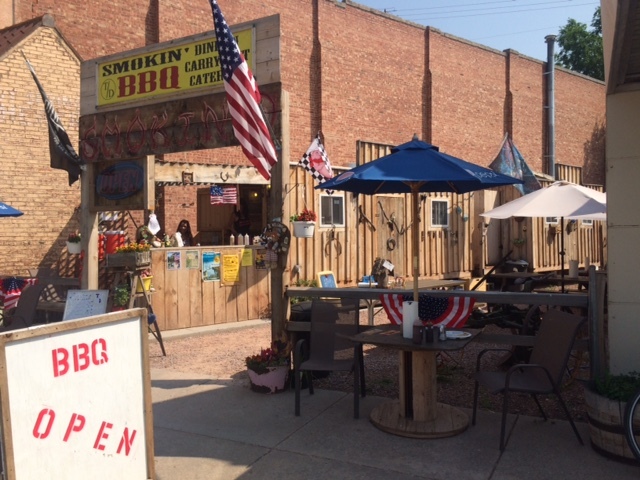 Arrived in Hot Spring’s too early for lunch but found a BBQ place that was willing to dish me up, which was good as I had no sure services for the next fifty miles. 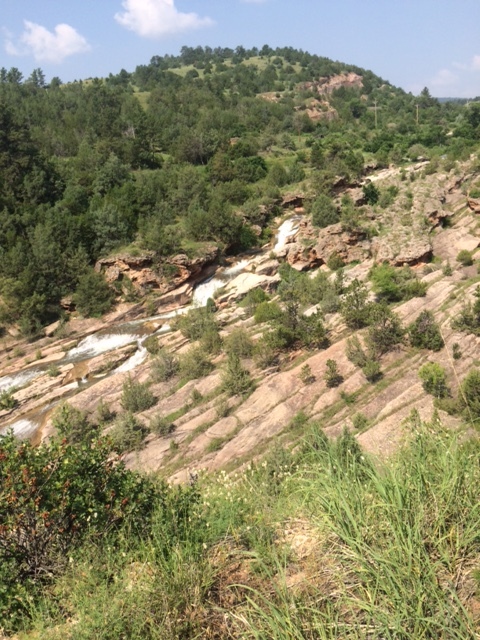 US 385 follows the Falls Creek out of Hot Springs, which terminates in a calendar worthy cascade of rocks and rapids. 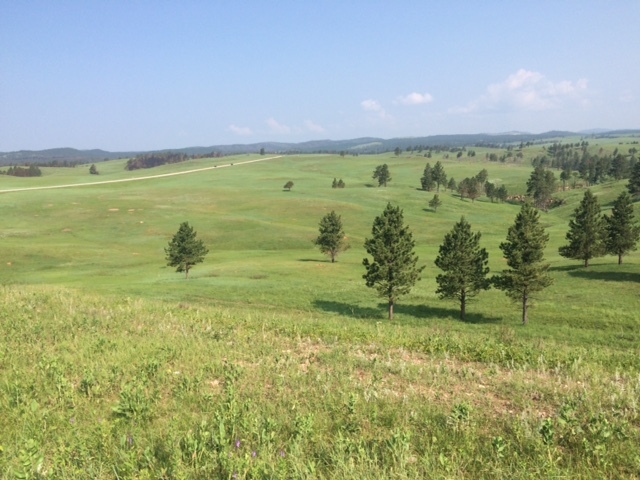 And then, quick as that, the Black Hills are over and the Prairie regains the upper hand. A mile beyond the falls, the scene behind was mountains, ahead only plain. Lucky me, there was a cafe in Oerlich, and so I took a break in the hottest part of the day. The place was empty when I walked in. “Where is everybody?” I asked. 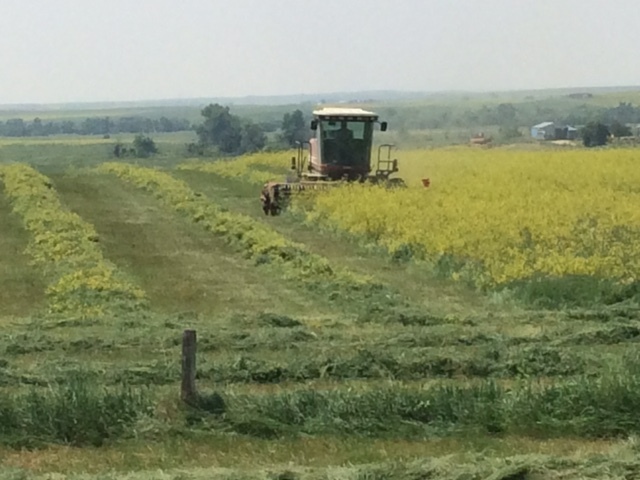 “Haying,” the waitress responded. A few other guys trickled in, but she was right. On my way out of town I saw several combines churning hay. Someone even rowed the grass along the highway, which makes good sense. Might as well put that grass along the road to use. 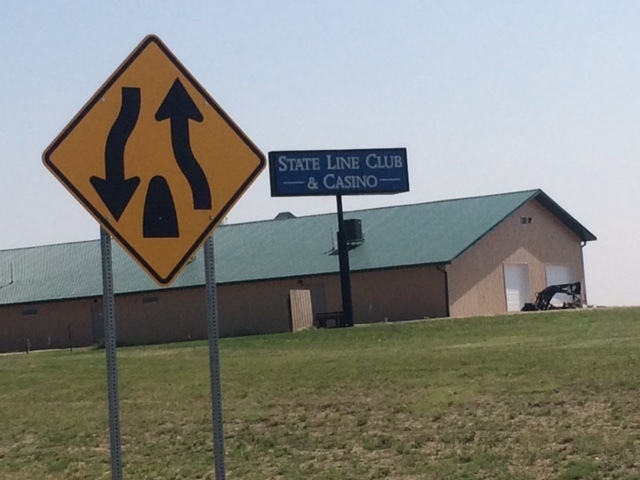 Southwest South Dakota is one giant federal playground where beer is easy and gambling machines are rampant. 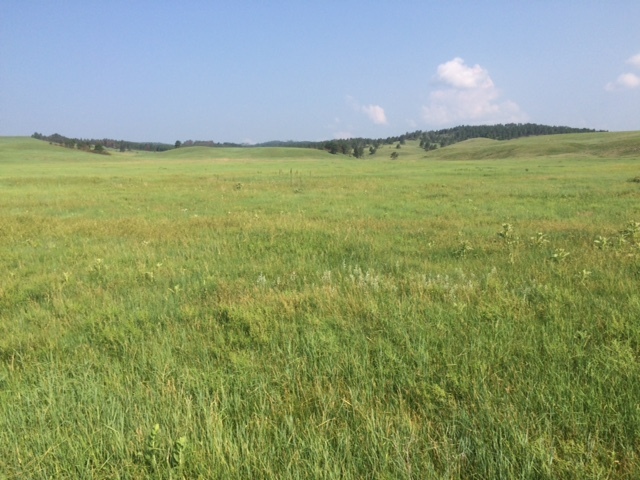 What isn’t National Park is National Forest, and what isn’t National Forest is National Grassland. The roads are terrific; the number of RV’s too high to count. 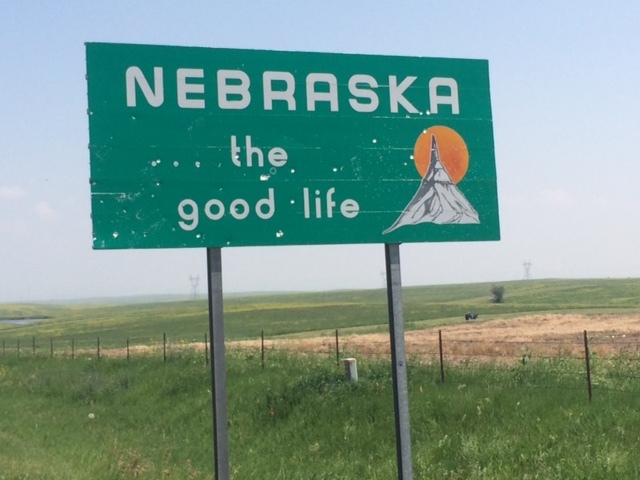 So it was easy to spot the Nebraska border, where the four lane divided highway turned into two-lane blacktop and the State Line Casino marked the divide. 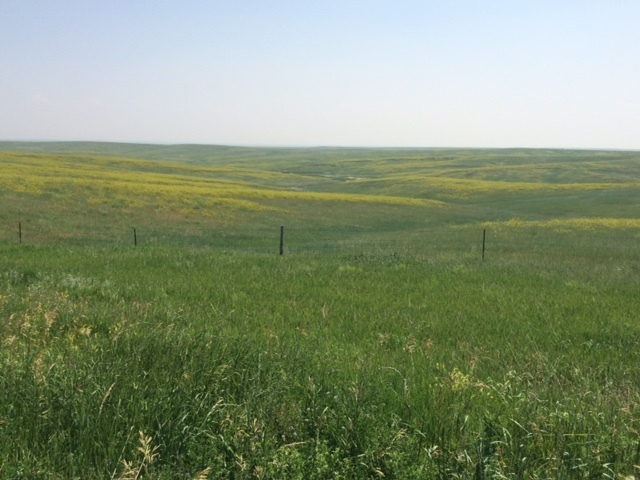 No worry, a narrower 385 is still plenty for the scant traffic, and the Nebraska landscape is even more fantastic than South Dakota’s. 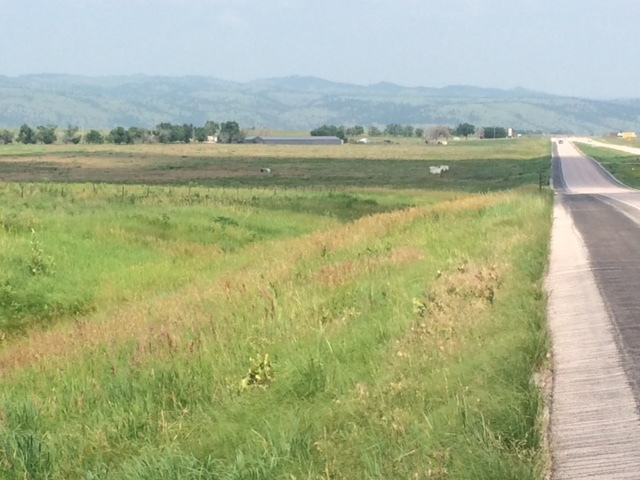 If cycling the Dakota’s is like riding on the crest of the earth, Nebraska is skimming across an immense marble batter. The green grass and yellow goldenrod swirl in and around each other in dizzying swales. The road disappears to a thread. The afternoon turned blistering hot, the horizon melted into a blurry haze. 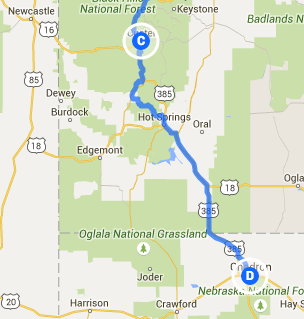 I spun the last twenty miles to Chadron in a dreamscape. Fortunately, I stayed alert. For although I avoided stray Bison at Wind Song, I came upon a large white animal roaming the side of the road ahead of me: a small horse, a large dog, an albino burro? I slowed to a crawl; thankful the wind wasn’t sending my scent its way. Eventually it crossed the road and disappeared behind a cattle guard. I approached, keeping my eye in its direction. When I came along the guard, the mammoth canine turned and came at me. I pedaled like crazy; thankful a pickup was coming over the rise between the huge creature and me. I kept my max speed for a half-mile or more before finally looking back. All clear. I arrived in Chadron at a nice motel, got cool and clean, walked over to Safeway and bought fried chicken and muffins, which I ate outdoors. 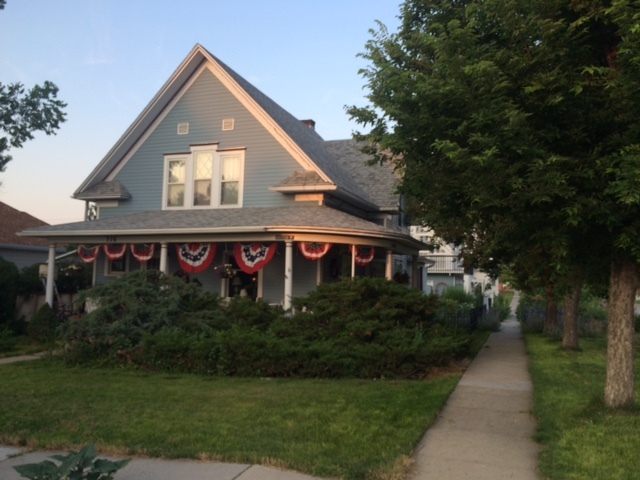 Took a walk through the quiet prairie town. People were setting off all kinds of firecrackers. 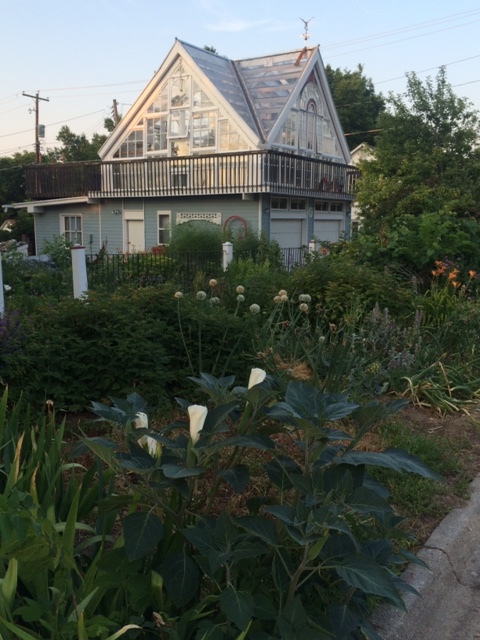 I particularly liked this gracious old house with a cool greenhouse/garage. When I got back to my motel, the innkeeper was holding court in his gazebo with beers all around. Back to my room, I fell asleep amidst the sounds of rockets red glare smack in the middle of this remarkable country. Happy Birthday USA!